Immunoassays are bioanalytical methods based on antibodies. These include ELISA, EIA, RIA, Western blotting, protein arrays, lateral flow assays (immuno-chromatography), immunohistochemistry or immuno-PCR. Antibodies detect the substances (analytes) in immunoassays. This detection is always highly specific and only the analytes are detected and bound. This is the theory! Practically any antibody not only binds its analyte. It also binds several other substances, but with very different affinities. Additionally antibodies can be bound or masked by several substances derived from biological specimen. They can also be cross-linked by some substances. Heterophilic antibodies like human anti mouse antibodies (HAMAs) are probably the best known example of such cross-linkers. But also rheumatoid factors are cross-linkers, which occur regularly in patient’s samples. Not only antibodies, but also analytes can be bound by other molecules and therefore masked. This masking can avoid binding by the antibodies. The c-reactive protein (CRP), which occurs sometimes in quite high concentrations, is only one example for such masking molecules. Such masking molecules are not only known in human diagnostics, but also in nearly any kind of complex biological matrix even in animal derived or vegetable specimen. Not only human diagnostics, but also veterinary diagnostics, medical, biological and pharmaceutical research, toxicological testing or even food diagnostics are affected negatively by those effects. Therefore we want to show a short overview of different groups of interferences as well as a widely working approach to solve those problems. Examples show the successful use of the modern assay diluent LowCross-Buffer® for avoiding interferences caused by heterophilic antibodies, HAMAs, rheumatoid factors but also by unknown or unclear problems. Reliability of results and precision of immunoassays can be enhanced significantly. Levels of detection can be optimized. Fig. 1: Schematic picture of a choice of different interference effects which may appear in immunoassays. A: Unspecific binding of a labelled detector antibody to a not blocked surface. The results are false positive signals. B: Unspecific binding of a labelled detector antibody to a blocked surface. Despite blocking of the surface the antibody binds to the blocking proteins itself. The results are false positive signals. C: An interfering protein binds to the Fc segment of the detector antibody and hinders sterically the binding of the analyte. The results are false negative signals. D: The capture antibody binds to the Fc segment of the detector antibody. The results are false positive signals. The analyte cannot be bound by the capture antibody any more. E: Uninfluenced assay without any interference. The ideal state of affairs. F: A „bridge binding“ by heterophilic antibodies or by HAMAs. Through this the capture antibody is connected with the detector antibody so that false positive signals arise. G: A HAMA with anti-idiotypic binding qualities to the capture antibody. The interfering antibody binds in the area of the highly variable region of the Fab segment and thus prevents the binding of the analyte. False negative signals appear as a result of it. H: A HAMA with anti-idiotypic binding qualities to the detector antibody. The interfering antibody binds in the area of the highly variable region of the Fab segment and prevents the binding of the analyte. As a result of it false negative signals show up. I: Cross-reactivity of an interfering substance with the capture antibody. The results are false negative signals. J: Cross-reactivity of an interfering substance with the detector antibody. The results are false negative signals. 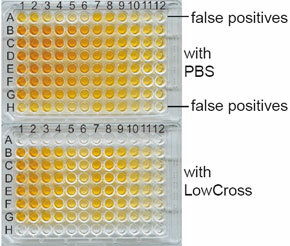 K: Cross-reactivity both with the capture and with the detector antibody. Such a phenomenon is rather seldom in practice, but definitely possible with antibodies having a lower specificity. Such an interference picture can happen also with antibodies directed to a target with a conserved amino acid sequence of a protein whose sequence motive also occurs at other proteins. L: Masking of the analyte by a protein of the specimen whereby the epitope is blocked for the capture antibody so that the binding to the analyte is not possible or in the case of a sterical hindrance is very bad. The results are false negative signals. Labelling of detector antibodies with enzymes like horse radish peroxidase (HRP) or alkaline phosphatase (AP), labelling with biotinylation, with DNA (for use in immuno-PCR) or with dyes like fluorescence dyes can lead to interference effects. Labelling can change the binding characteristics of antibodies. This is noted especially with high label-rates (many labelling molecules per one antibody molecule). But also the labels themselves can bind each other, can bind antibodies or sometimes can bind unspecifically parts of the specimen or matrix. Especially fluorescence dyes are well-known for their hydrophobic interactions leading to agglutination of antibodies. Those unwanted binding effects worsen assay performance. Matrix effects are the sum of all interferences of the components of a specimen, which can affect the measurement of a targeted analyte. If the molecular reason for assay imprecision is not known, but it can be associated with the composition of the sample, then it is simply called a matrix effect. Unclear interferences can be called matrix effects. They can be effects of anti-animal-antibodies, heterophilic antibodies, and endogenous interferers and also influences of viscosity, pH-value or salt concentrations. Human anti-animal-antibodies (HAAA) can be of the IgG, IgA, IgM or IgE type. They are part of the humoral response on the contact with immunoglobulins of animal origin. HAAA’s are important interferers of many diagnostic immunoassays. Some clinical studies have shown up to 80% of all patients’ samples contained such HAAA’s in concentrations of up to some milligram per millilitre. There is a high sequence homology between antibodies of different species. Therefore HAMAs can affect even assays, which don’t use mouse antibodies, but assay antibodies of different species. The same kind of cross-linking of assay antibodies is reported from heterophilic antibodies and also from so-called rheumatoid factors. The frequency of those problems in diagnostics increases significantly during the last years due to rising numbers of patients with autoimmunity, rheumatoid or allergic disorders. Additionally the therapeutic use of antibodies especially in oncology boosts the frequency of this kind of interference in diagnostics. Some of those oncology mAB drugs are blockbusters and therefore numbers of patients are quite high. The need for facing this problem of cross-linkers is nowadays much more important for manufacturers of immunodiagnostics than several years ago. Until now most producers use the so-called HAMA-blockers. But that means, that biological active substances are added to the tests – enhancing the risk of negative effects. And the HAMA-blocker are solely effective against HAMAs and show less effectiveness to other cross-linkers. The modern antibody diluent LowCross-Buffer® can not only minimise negative effects of heterophilic antibodies, but also the negative effects of other cross-linkers like rheumatoid factors and others. It is used effectively as assay buffer, as antibody diluent or even as sample buffer or sample preparation buffer. Even naturally occurring proteins in specimen can interfere with immunoassays. Well-known interferers in human sera are albumins, complement, lysozyme, fibrinogen or proteins like c-reactive protein or alpha-1-antitrypsin. Especially analytes of low molecular weight can bind to albumins. In that case some antibodies cannot bind any longer their analytes. Many hormones are bound to specific transport proteins for hormones and therefore they are not free for binding of assay antibodies. Many other proteins bind other proteins or substances due to their fundamental biological function. Albumins, complement factors and CRP are natural receptors for many substances. Therefore – similar to the situation with antibodies – non-specific binding and cross-reactivities occur, which sometimes can affect the detection of analytes in assays. Endogenous proteins can either bind and mask the assay antibodies or even mask the target analyte. For example lysozymes bind non-specifically proteins with a low isoelectric point. Therefore antibodies which have an isoelectric point of about 5 can be bound and build a bridge formation between capture and detector antibody. An important aspect, which should be mentioned, is the interference by strongly lipid containing specimen. Some analytes are fat-soluble and as the case may be the binding between antibody and analyte can be affected by lipids. The reasons for the described interference effects are similar. There are unwanted low up to medium affinity interactions of the interfering factors with the assay antibodies or the analytes. These interference effects have something in common which the newly developed LowCross-Buffer® makes use of: The interference reaction is weaker than the specific binding of the real analytes to the assay antibodies. LowCross-Buffer® was developed to eliminate weak and medium affinity binding without affecting negatively high affinity binding with high specificity in any way. Figures 2 to 4 show examples of typical interferences which can be prevented by using LowCross-Buffer®. 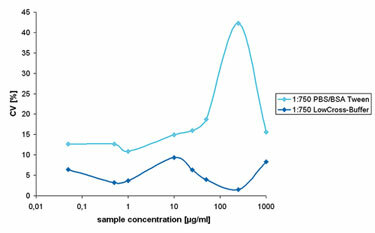 Figure 2 shows an ELISA against immunoglobulins from guinea pig (data kindly provided by Dr. C. Specht, PARA Bioscience, Gronau), which is used for immune toxicological studies with guinea pig. False positives in specifity control (row of A1-A12) as well as in the blank values (H1-H12) spoiled the interpretation and evaluation. The use of LowCross-Buffer® prevented the false positive signals and moreover made the detection of the concentration possible in the rows of B to G 1-6 or B to G 7-12. Fig. 4 shows prevention of interference derived from HAMAs and rheumatoid factors. The effectiveness of LowCross-Buffer® towards HAMA and RF derived interferences has been quantified in a CE-certified ELISA (HAMA-ELISA, medac, Germany) using commercial HAMA and RF positive human blood samples (in.vent diagnostica, Germany and Scantibodies, USA). The complete available panels were evaluated. 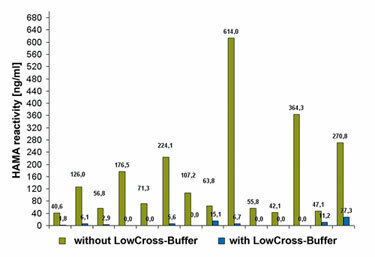 Representative results obtained with and without LowCross-Buffer® are shown. LowCross-Buffer® reduced interferences in all HAMA and RF positive samples to background levels (< 40 ng/ml according to HAMA-ELISA manual). Translated article, originally published in the German lab techniques magazine LABORWELT. This translated article can be found on www.candor-bioscience.de for downloading.